My mother emigrated on her own to New York City from Sweden in the 1960s. I grew up in the borough of Queens not far from JFK Airport. Mom worked for Scandinavian Airlines so it wasn’t uncommon for us to travel, either stand-by or for just $20, to my grandparents in Sweden for the entire summer, holidays, or long weekends. It was from my grandparents that I learned how to live off the land. No matter what I was learning—planting, harvesting, foraging, fishing, hunting, canning, or fabricating and smoking meats—there was never any waste. 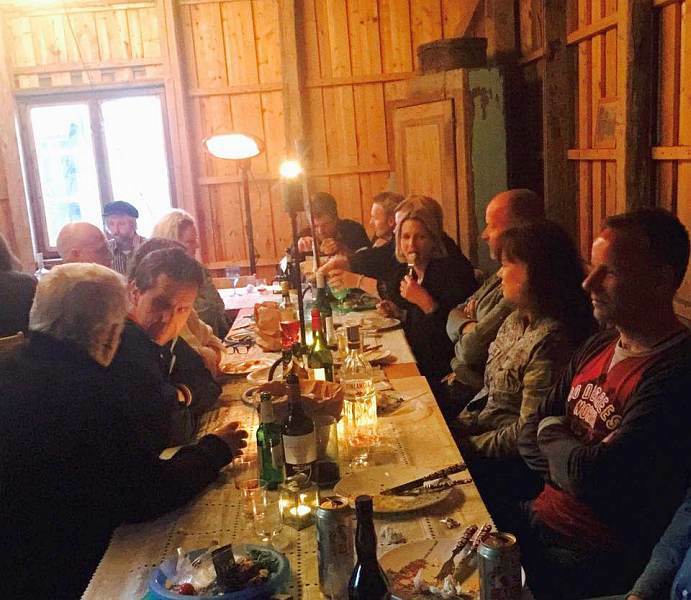 For them, their cottage and barns—dating back to the 1800s, on a small plot of land in the countryside of Dalarna—was the epicenter for keeping their family whole during good and lean times. Being a kid from a “rough around the edges” neighborhood and living through the tumultuous 1970s in New York City, that same cottage and village in Sweden were, and still is, my haven. My grandfather worked most of his life as a mason in the city of Stockholm. 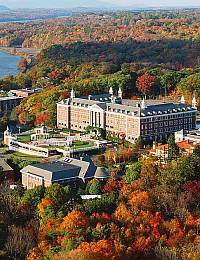 But his passion for hunting, fishing, and foraging led him to constantly explore the nearby dense, undisturbed forests. 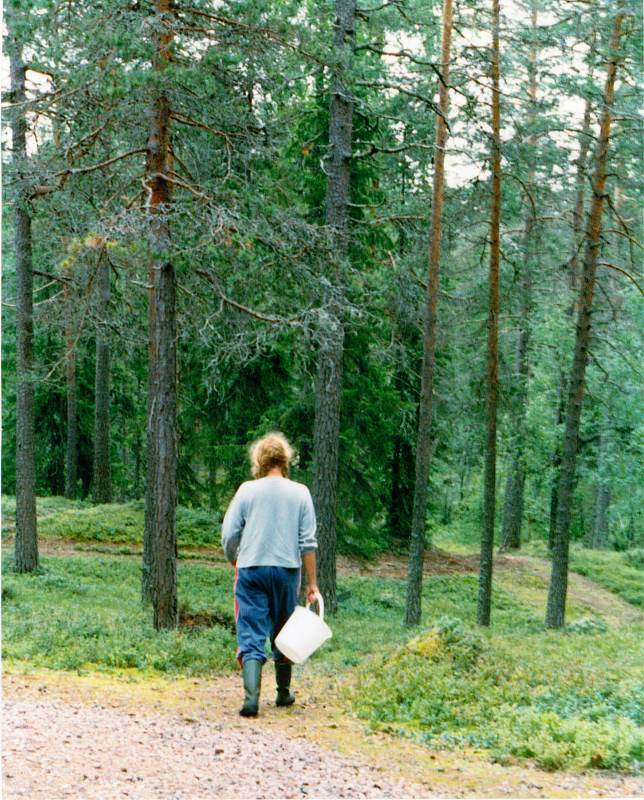 I often went with him…carrying my magical “bärmaskin” (berry picker) and a bucket. I never emerge from the forests without my face and hands stained from the copious amounts of wild Blåbär (blueberries), Hallon (raspberries), and Lingon (lingonberries). If we were lucky, we would find a sweet spot of plump Hjortron (cloudberries) that lay like a golden blanket glistening in the sunlight through the trunks of pine trees. I learned to identify the hiding places of treasures of wild mushrooms like the coveted Kantareller (chanterelles)—under a specific type of tree that had the right amount of mulch and “just right” weather conditions. With my wonderfully worn Morakniv, (Mora utility knife) I whittled a walking sticking specifically designed to check for mushrooms. I still have it some 40+ years later. 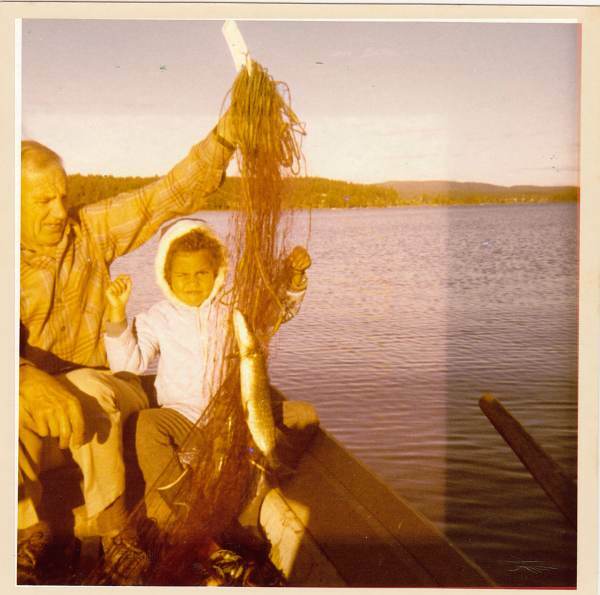 It wasn’t uncommon for us to fish before breakfast—Abborre (Perch), Gädda (Pike), and the occasional Lax (Salmon) were plentiful in Lake Siljan, which lays like its own vast universe nourishing surrounding villages. Occasionally, we’d improvise a smoker by digging into the side of a small hill, carefully burning brush of foraged juniper and pine twigs, low and slow. My grandmother was a phenomenal cook and baker. She taught me the craft of canning everything that was harvested from the forest and our garden including: Rabarber (rhubarb), Jordgubbar (strawberries), Smultron (wild strawberries), Svartvinbär and Rödvinbä, (black & red currants), Körsbär (cherries), Krusbär (gooseberries), Nypon (Rose Hip), Potatis (potatoes), Ärter (peas), and various Örter (herbs). We made Sylt (preserves), Saft (concentrated berry juice) and Kräm (compote) that were jarred, bottled, tagged, dated and placed in a crawlspace under the cottage and stored for years—like fine wine. Occasionally I would take an adventure into the unknown and would stretch myself into the dark crawlspace—as far back as possible— hoping to find the oldest, dustiest bottle. Sometimes I could find a precious sample of my great-grandmother’s preserves. I still own those same dusty bottles and jars, and they occasionally land on a TV show or magazine spread I’m styling to echo a time past and its superb handling of food. 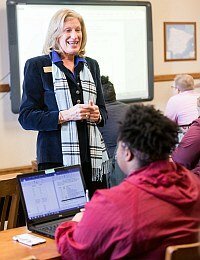 As a student in the U.S., almost every school year was cut short by a few days when I was sent to my grandparents for the long-awaited festivities surrounding the height of Summer Solstice. People of all ages look forward to celebrating with family and friends with music, dancing and a shared bounty of food. With 24-hours of daylight, “Midsommar Dagen” (Midsummer Day) lands on the 4th Saturday in June like a faithful, happy friend after the long, dark days of winter. 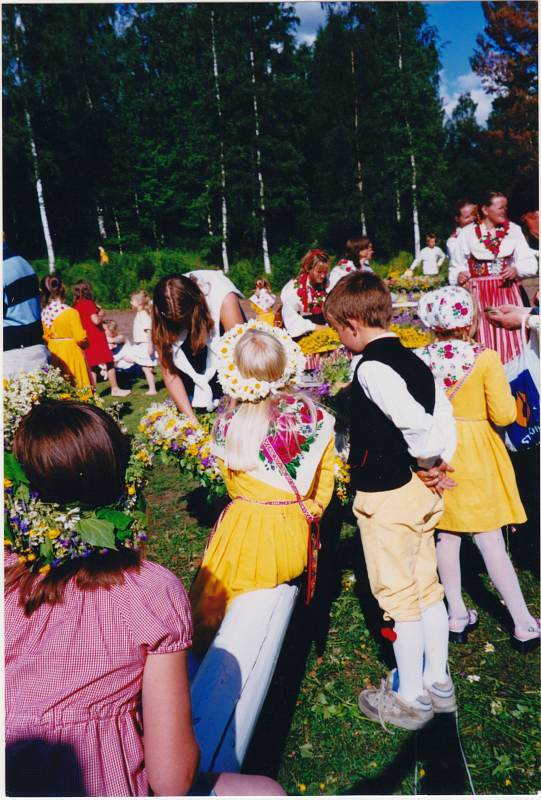 In preparation for the day, it is innately understood that we must gather thousands of wild flowers and birch leaves to dress the village pride—the “Majstången” (maypole)—and make wreaths that are worn as crowns and adorn entrances. 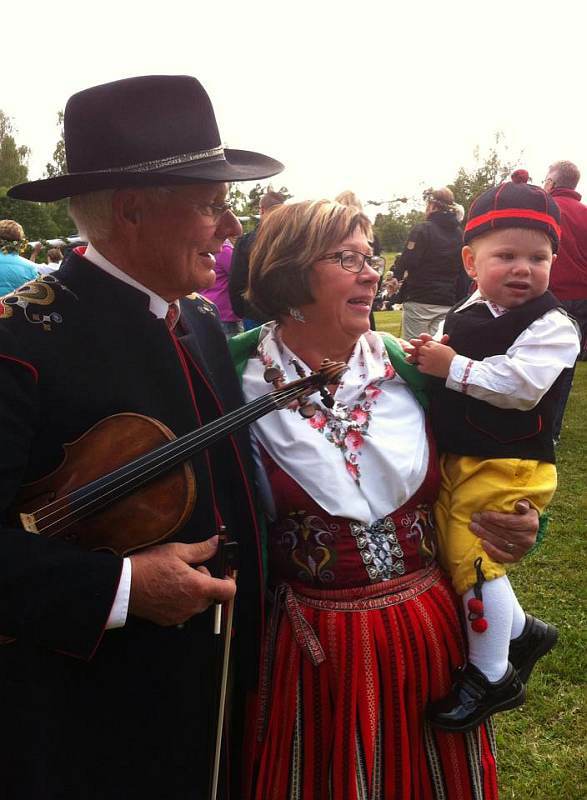 Children and adults often wear a folk dress with colors that represent the community or region in Sweden they are from. These dresses and uniforms are handmade heirlooms passed down through generations with great care. Fun note: They are commonly sprinkled with white pepper to ward off moths when put into storage! Our entire village gathers rain or shine to share handmade baked goods like Hårtbröd (crisp bread). It is flat and hung in ceilings on rods through a hole in its center to dry out after being baked. We prepare stacks of ham and cheese sandwiches made of Mjukbullar (savory flat buns). 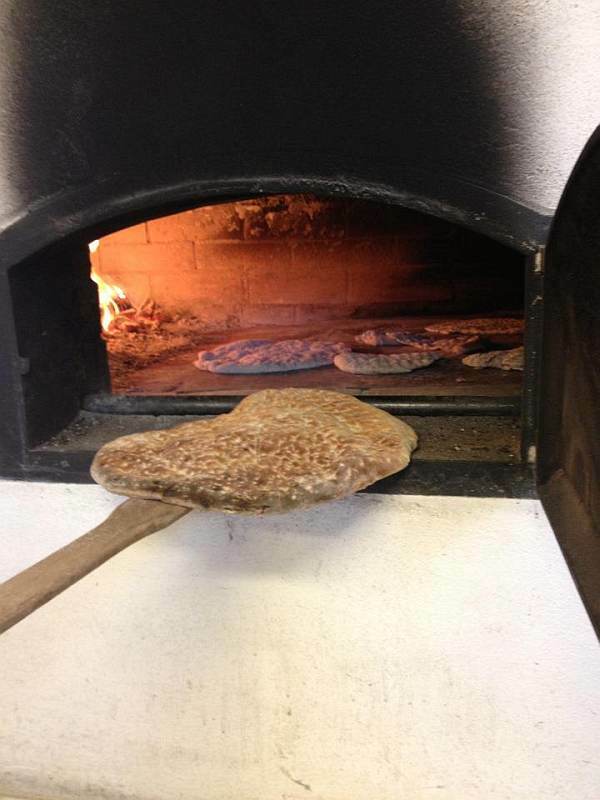 Both breads are made in the village communal wood-fired, stone oven using long-handled paddles, just like pizza. We share Bullar (sweet braided buns with pearls of sugar), Kakor (various cookies), Korv med Bröd (sausage with buns), Kaffe (Coffee), Saft (concentrated juice diluted with water), and Lättöl (low alcohol ale). Traditionally, the strongest men of the village share the task of raising the maypole using birch pillars that are tied together with strips of bark or rope resulting in giant chopsticks. 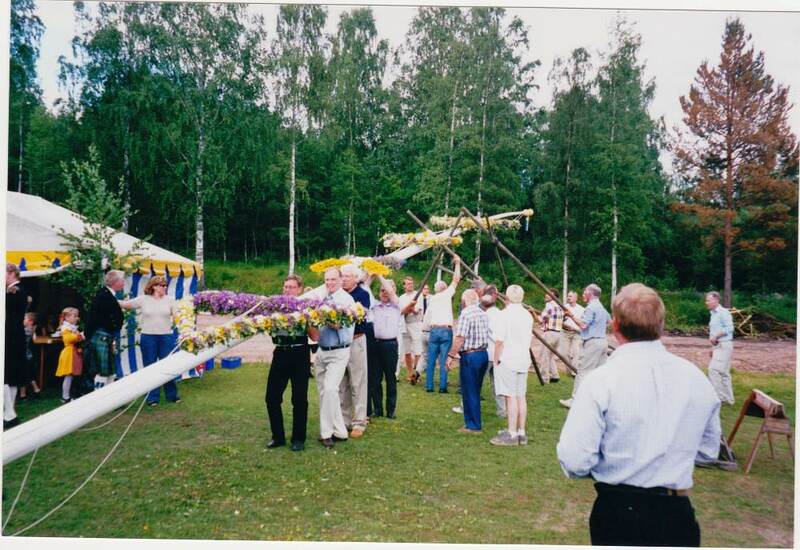 In succession, they raise the flowery clad maypole from horizontal to vertical. The process takes about an hour. Once raised, singing and dancing around the pole commences! Matjessill (Matjes Herring), Inlagdsill (Pickled Herring), Senapsill (Mustard Herring), Räkor (head-on, cooked, unpeeled, sweet shrimp), and Gravlax (cured salmon) with Dillsås (dill sauce). Not to be outdone, the wild meats include Älg (moose), smoked Renkött (reindeer,) and Rådjur (deer). Most dishes are served with Nypotatis (young potatoes) served slightly scrubbed to leave patches of tender skin, with bowls of scissor-cut Grässlök (chives) and Gräddfil (sourcream). I remember vividly how my grandfather used to dig up the smallest potatoes possible, boil them only for a couple of minutes in salted water with fresh dill. He’d hand me a wooden knife, fresh-made butter, and a bowl of hot Nypotatis. 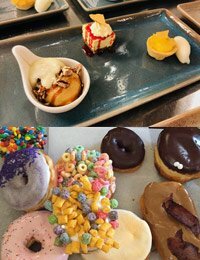 I’d popped them in my mouth as if they were candy. 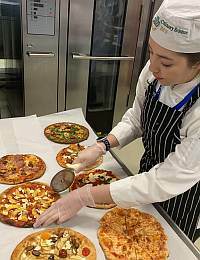 The Summer Solstice, its traditions and foods influenced me greatly growing up and is largely responsible for what gave me a love of food that eventually brought me to CIA in 1998. I wanted to learn how to apply what truly feeds my Nordic soul into an expression of my craft.